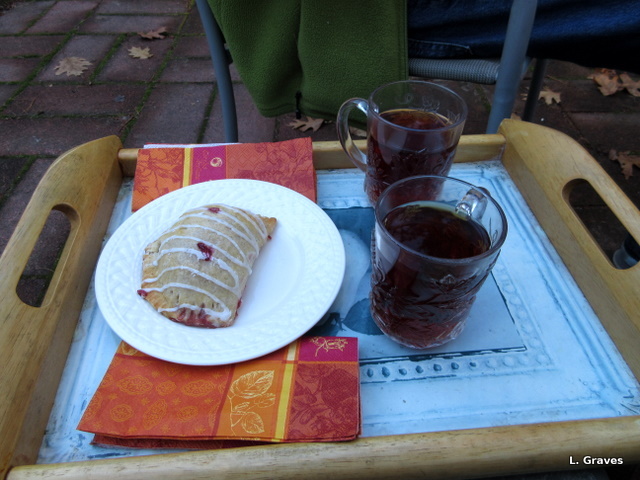 This afternoon, it was actually warm enough to have tea on the patio after we came home from doing errands. If this isn’t an example of “wicked weird,” as we Mainers would say, then I don’t know what is. Sixty degrees in mid-November in Maine? In what multiverse has that ever happened? In the old days, when I was young—heck even ten years ago—November in Maine was what might called pre-winter. The ground was hard and frozen, but usually there was no snow or slush. This pleased my mother’s Franco-American heart, and it pleased mine as well. Sometimes we got snow by Thanksgiving. Sometimes we didn’t. But we definitely didn’t have green grass, soft ground, and tea on the patio. I must admit, with a touch of sheepishness, that I do enjoy the milder falls we are having. As we sat on the patio, Clif and I watched the birds swoop and flutter from the trees to the feeders. What a blessing to have these winged visitors come to the backyard in all seasons—winter, spring, summer, and fall—and in all weather. Surely, today will be the last day for tea on the patio, and we will bring the two patio chairs inside. Tea on the patio in Maine in December is just too absurd to consider. I like the look of that turnover. It was pretty darned good, as my Yankee husband would say. Like you, I am enjoying the mild weather, because in Canada we’ve been told to expect a rough winter. Tea on the patio in late November. Crazy, isn’t it, Laurie? Reminds me of the year I returned from The Netherlands with a gift of tulips at the end of November, wondering what on earth I’d do with tulips so late in the year — only to find that I’d come home to balmy weather. The tulips were planted! Yay for planting those tulips! The weather is indeed crazy. Good for the heating bill, though. Very crazy! Never have I had tea on the patio in mid-November. Our high was only 52, but we definitely enjoyed/relished the weather today. Who knows when we’ll see such comfortable temps again? 😉 Feeling pretty wintry out there today! A dusting of snow this morning when I got up. I took some good pictures for the blog, which I’ll be posting shortly. I put the patio chairs away last week, so hauled an indoor chair onto the deck yesterday and sat and read in the sun. Crazy, but I’m taking full advantage of it. I know. It’s hard not to like this weather. But, as I mentioned in the post, it’s wicked weird. It is such a mixed blessing. I enjoyed our day in Boothbay even as I worried about global warming. But tea on the patio sure does sound nice. Beth, I know just what you mean. Tea on the patio, with the birds fluttering around us, was just great. But in mid-November? Craziness! Thanks, Johanna! I bought the tray at a shop that features British goods. It’s not too far from where we live. I don’t go there too often as I am always tempted by the many delectable items for sale. However, that tray was a very good purchase as we use it all the time in the summer. Glad you got those windows cleaned while the weather was warm.